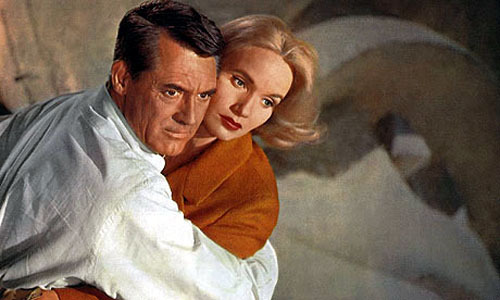 Robert Boyle: Art director collaborated with Alfred Hitchcock on the 1959 thriller North by Northwest, starring Cary Grant and Eva Marie Saint. Iconic Production Designer Robert Boyle (a.k.a. Robert F. Boyle), who collaborated with Alfred Hitchcock and Norman Jewison, and the recipient of an Honorary Oscar in 2008, died on Aug. 1 of “natural causes” following a two-day stay at Cedars Sinai Hospital in Los Angeles. He was 100. The Hitchcock films on which Boyle worked are: as associate art director, Saboteur (1942) and Shadow of a Doubt (1943); as production designer, The Birds (1963), Marnie (1964), and most notably North by Northwest (1959), which features Cary Grant and Eva Marie Saint facing nasty spies atop Mount Rushmore. Boyle's other major motion picture credits as a production designer include numerous Universal releases of varying degrees of budgetary size (Ma and Pa Kettle on Vacation, East of Sumatra, The Private War of Major Benson), plus Winter Kills, The Best Little Whorehouse in Texas, Portnoy's Complaint, and Private Benjamin. Also, In Cold Blood, How To Succeed in Business Without Really Trying, The Shootist, the 1962 Cape Fear, and Norman Jewison's The Thrill of It All; The Thomas Crown Affair; the Oscar-nominated The Russians Are Coming, The Russians Are Coming; Gaily, Gaily; and the 1971 blockbuster Fiddler on the Roof. Born in Los Angeles on Oct. 10, 1909, Boyle was a graduate of the School of Architecture of the University of Southern California. Upon graduation in 1933, he began his art direction career at Paramount, later moving to Universal Studios, where he would remain for the next several decades. In addition to Hitchcock and Jewison, Boyle worked with the likes of Richard Brooks, Michael Gordon, Alexander Hall, Penny Marshall, Budd Boetticher, Joe Dante, Sylvester Stallone, Hal Ashby, Arthur Hiller, Don Siegel, and Tom Mankiewicz (who died this past Saturday; see further below). Throughout his 50-year film career, Boyle earned four Academy Award nominations for Art Direction: North by Northwest (1959), Gaily, Gaily (1969), Fiddler on the Roof (1971), and The Shootist (1976). He was also nominated for an Emmy for the television movie The Red Pony (1973), directed by Robert Totten, and starring Henry Fonda and Maureen O'Hara. Additionally, in 1997 Boyle was voted a Lifetime Achievement Award by the Art Directors Guild and in 2001 he was honored with the Hollywood Production Designer of the Year Award by the Hollywood Film Festival. He served as a member of the Board of Governors of the Academy of Motion Picture Arts and Sciences for nine years and was a two-term president of the Art Directors Guild. In recent years, Boyle was the subject of Daniel Raim's Oscar-nominated documentary The Man on Lincoln's Nose (2000), and he's featured in Raim's latest effort, Something's Gonna Live, about several legendary production designers. Boyle was recently the subject of a tribute by the American Cinematheque and the Art Directors Guild, which held a screening of two of his efforts at the Egyptian Theatre: the horror classic The Wolf Man (1941) and Gaily, Gaily. His wife, Bess Taffel Boyle, died in 1999. Mr. Boyle made some incredible and everlasting contributions tothe film and entertainment industries. He will be greatly missed yet fondly remembered for his dedication to his work.